Today we assessed Louie early in the AM. He is a fifty-eight pound, tan and white, Border Collie Mix. Louie hung out in the Medium Roll today and truly thrived. He communicates with other dogs well, it looked like he enjoyed himself. Louie is most definitely welcome back to The Fort. We think he'll be back in to mingle with the pack soon! Darn! Those little guys upstairs sure know how to have a good time... Check them out in these two clips from this afternoon. Dog saved elderly lady from Tsunami? If you are comfortable with it and have the time, please tell the world how great Fort Fido Doggie Daycare is ;) by leaving us a online review. You can leave us one through Google, Insider Pages or even Yelp. We currently have a "four star" rating... I think it should and could be five so please help us out! A few customers have already been kind enough to leave us some awesome reviews. We thank you and truly appreciate your continuous support! P.S. Here is the link to the reviews we have gotten so far, thanks again. This morning we assessed Jasmine. 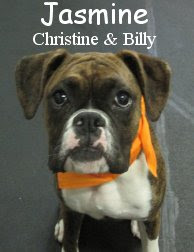 She is a six month old, thirty-six pound, Brindle (with white socks and chest), Boxer. Jasmine was all about attending Fort Fido. The coolest part is that her litter-mate sister Stella already plays here daily! The two met with a fervor, instantly going into play. It was sure neat to see the sisters reunited. Like Stella, Jasmine spoke good dog, played hard and thoroughly enjoyed her stay. For now, both of these boxer gals hangout in the Medium Roll. In time, they will most likely transfer to the Big Roll. Excellent job Jasmine, we know we'll be seeing you soon. If you're looking for some feel-good news, here's a touching story about a missing dog being reunited with her owner. Links / come to the Tartan Ball! We had two assessments early this morning, litter mates, Benny and Leo. These two are super good looking, practically twins! Benny and Leo are twelve year old, chocolate brown, Cocker Spaniels. 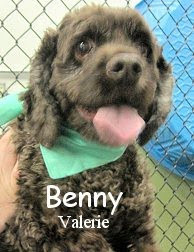 Benny is twenty-five pounds and has a milk chocolate colored coat. 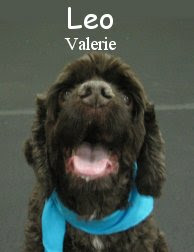 Leo is thirty pounds, he has a dark chocolate colored coat and a little patch of white on his chest. This dandy duo was fit for the Medium Roll. They are happy little guys who are well adjusted and very social. Benny and Leo both played a little bit today and seemed to enjoy their time with the pack. Based on their energy levels, you would never guess that these two dogs were twelve years old... Five or six maybe, these are healthy dudes! Hopefully Benny and Leo will be back at The Fort soon, they're most definitely welcome. P.S. My friend Bruce (fellow Bagpiper, Clan Gordon Pipe Band) sent me a link to a hilarious video. Check out TWO DOGS DINING for a good laugh. Here is new friend of The Fort Aliisa playing hard with Pepper in the Big Roll. From the Medium Roll we see Romeo rolling around with Bella. Upstairs in the Little Roll Koji and Zhuni hooked up for some rough housing. You might not have seen these yet. Thanks to Rainier's pa Colin and Miller & Paisley's ma Tracy. If this one isn't a heart-warmer, I don't know what is! This morning's assessment was Bella. 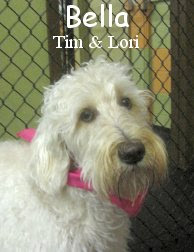 She is a loving, one year old, fifty-three pound, apricot/cream colored, Labradoodle. Bella did an amazing job today, she went right to playing, spoke good "dog" and seemed to enjoy herself tremendously. Bella will be a superb addition to Fort Fido's Medium Roll. We hope to see her attend regularly. Nice job today Bella! I hope your week is off to a great start, spring is here woo-hoo! P.S. Baker wins Iditarod, Service dogs in training, Don't blame your dog for Strep Throat and Five tips for finding a lost dog. Today at the Fort I caught all kinds of action on camera! Here is a nice story about an abandoned dog's new lease on life. Dog helps boost kids confidence and self-esteem at school. Check out this cute clip of some puppies trying to eat from the same bowl! 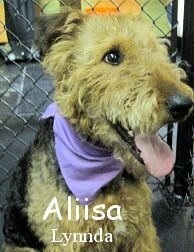 This morning we welcomed a brand new member to the Fort Fido pack: a one-and-a-half year old Airedale Terrier named Aliisa. She was a little bit unsure of what to think, and will likely settle in well with time and consistency (which are definitely the key ingredients to getting the most out of daycare). We'll be seeing her again next week! Airedales are originally from Yorkshire, England, and are sometimes called the "Kings (or in this case, Queen) of the Terriers" since they are the largest of the terrier breeds. Their original purpose was to hunt otters and they are incredibly intelligent, having been bred to hunt independent of a handler. P.S.- Since you know that I always enjoy a good science article, I'll share this really neat one about how a gene leading to extra-wrinkley Sher-peis also increases their risk of frequent fevers. We are all aware of the tragic events in Japan. Our hearts go out to all of the people engulfed in the crisis. I was sent a sad yet incredible video clip today that was shot amid the destruction of Japan's devastating Earthquake and Tsunami. It is of a loyal canine who will not leave his deceased companion behind. Here is the link that translates the story. Later today in a search, I found a neat article about some US Search and Rescue dog teams deployed in Japan. Here is the link, In a battered Japan, dogs search for human survivors. 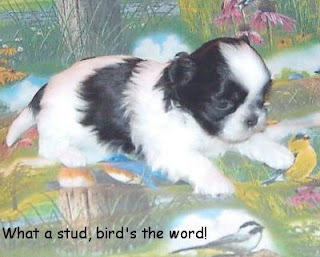 On a lighter note, I found an informative website that describes dog breeds of the world. 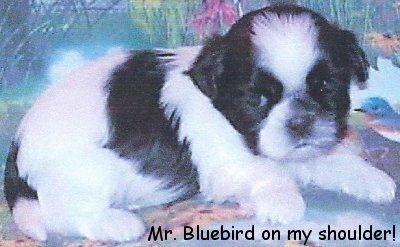 I thought I would research the native dogs of Japan. Here at Fort Fido, we have an Akita named Kyoshi and a Japanese Chin (arguably Chinese in origin) named Charlie. In the past we've had a few Shiba Inu Mixes. A couple of pics, a couple of clips. Logan lounging with his main pal! Logan's ma Becky sent me these snazzy pictures of her main man. They are great, thanks for sending them in Becky! Scored two good clips of Blue and new Bulldog Zora playing together in the Big Roll. Have a look. There is another new puppy in the house! Long time Fort Fido supporter Finny has got a new member in his pack. His name is Ozzie and he's just a wee Yellow Lab baby right now, he's not even ready for The Fort yet. Finn and Ozzie's owner Rob sent me this great clip of them playing together from his cell phone. What technology lol! When I converted the clip to play on the computer the quality went down, my apologies, either way it's cute! Diego's ma Carla sent me a great picture of Diego in his bean bag bed. I also borrowed a few pics of him from her Blog. He has been coming to Fort Fido for quite awhile. Diego is a three year old, thirty pound, Medium Rollin', Beagle. Great pictures, thank you! Playin with the big kids! Today was little Puggle Buddah's first taste of the medium roll! On Saturdays, since there aren't as many dogs, they tend to get all grouped together. Buddah did great with the bigger guys, and they played very gently with him. I captured this great clip of Buddah playing with Chocolate Poodle Bella. Watch them tear it up! On another note--here's one more reason to take Fido on a regular walk, and how to help your dog age gracefully. Gracie came in for her assessment earlier today. 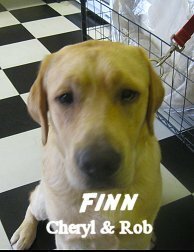 She is a three year old, seventy pound, savvy little blond... I mean, Yellow Labrador Retriever. Gracie hung out in the Big Roll, she was ready for the fun to begin as soon as she got in. 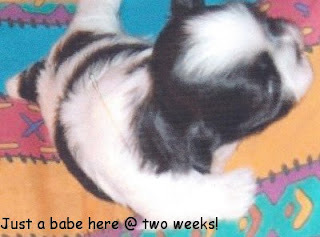 Denali was the first dog she got to meet, they went side to side, sniffed each other up and tails were a waggin'. Shortly after, the majority of the pack showed up. 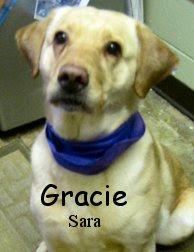 Gracie started playing with several different dogs, she speaks good "Dog" and definitely passed her assessment. Way to be Gracie, hope to see you again! P.S. Is it safe to kiss your pet? , How to protect yourself from dog attacks, Law aimed at making dog breeding more humane and Dog Trainer Ron Pace saves pet with CPR! One interesting note, a few of our customers have worked with Ron. A second interesting note is that his Niece's dog, Marley, just had his assessment about three weeks ago. Small world! This morning we welcomed Patty to Fort Fido, her assessment went pretty well. 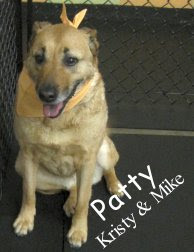 She is a eight year old, fifty-five pound, lovable, Labrador Retriever/Chow Chow/Shar-Pei (?) Mix. Patty had a nice build and deposition for the Medium Roll. She met Gibson and the two played a little chase game right away. As more dogs jaunted in, Patty seemed eager to interact with them. We will be working with her on a few things but for the most part she really did first-rate. It's most definitely not her first time around a pack. Miller and Paisley's ma Tracy sent me in a groovy action pic of Paisley sprinting on the beach, too cool, thank you! Marley came in for his assessment this morning. 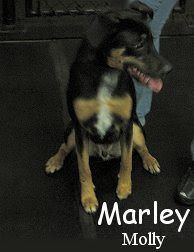 He is a one year old, thirty pound, Labrador Retriever/Rottweiler(?) Mix. Marley was the perfect size and had the perfect play style for the Medium Roll. He went in and began to dance a jig with Gibson right away. Marley is a rescue dog, one of his other unique features is that he only has one eye. I'll tell you what though, that doesn't slow this guy down one bit! 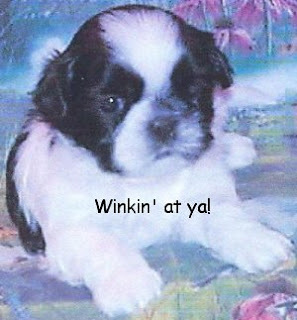 Another one-eyed pooch that attends The Fort is Elvis from the Little Roll. Nice job Marley, we'll see you soon! A new puppy for the Gartners! 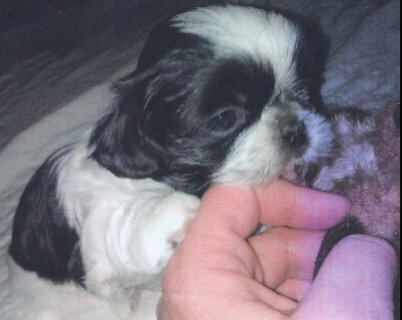 Most of you have heard the tragic tale of Fort Fido's little friend Hunter Gartner. If not, you can read about it here. We aren't here to discuss that sadness today. Today we want to make note of some new, happy beginnings! 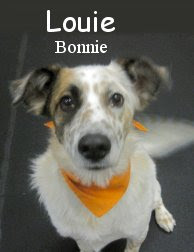 Bonnie and Bob Gartner are now welcoming new pup "Buddy" into their lives. He looks like he's going to be a lively chap, with Bonnie and Bob's loving care we are sure he is going to become a great dog. Buddy will start coming to The Fort once he is eligible. We are delighted to have him and are very HAPPY for the Gartners. Congratulations you two, what a looker! I'll leave you with his sneak peak pics. 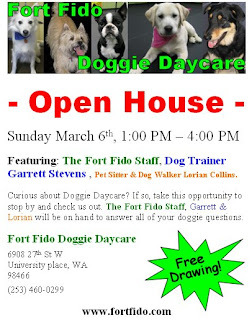 Our Fort Fido Doggie Daycare Open House was a great success. Thank you to all of our wonderful customers for your continuous support! Congratulations to our basket winner Sara Stewart. In this clip, you can get a glimpse of just about everybody that was here today! There was a lot of romping around, and dogs of all sizes got along swimmingly. Sorry for the posting delay. Technical difficulties strike again! Can Lance Mackey make it 5 Iditarods in a row? Today's assessment was Zora. 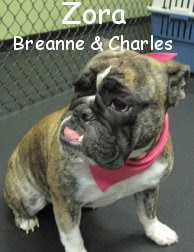 Zora is a fifty pound, two year old, black/white/brindle with black mask, English Bulldog. What a looker she was. Zora headed for the Big Roll and had no problem mixing it up with the pack. She played hard with several dogs, hopefully she'll sleep good tonight. Good job this morning Zora, we'll see you again soon. P.S. A few snippets for ya: Bad Dog Breath, Creating a dog-friendly backyard, Firefighters remove dog from fridge & Euthanized dog survives! 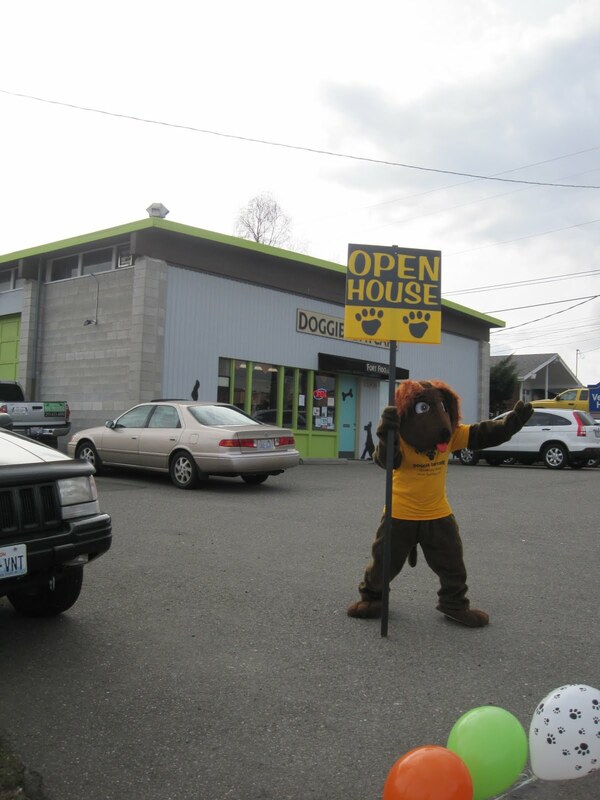 Come to our open house this Sunday! You can win this awesome basket in our free drawing if you show up! You must be present to enter the drawing but not present to win. The Fort Fido Open House is this Sunday March 6th from 1:00 PM - 4:00 PM. Please stop by and say hi, there will be guests and refreshments. 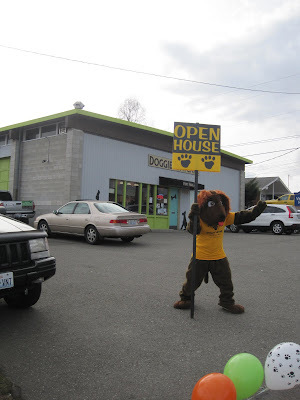 Of course our dog friends are welcome to come too! Just another note, there is still room in our Balanced and Calm Seminar Sunday morning March 6th from 11:00 AM - 12:30 PM (before the Open House). The seminar has been a hit for us, it is very informative. Get signed up! The cost is $50. Bring your pooch and questions. Trainer Garrett Stevens will be doing live demos. From the Medium Roll... Peaches and Trevor mix it up while stirring up a frenzy of fun lol. What good players! In the Little Roll, new pup Buddha starts a great relationship with "Mama Beija". Also, our manager Hope showed me this ultra-cute (her words haha) video clip she found on a friends Facebook page. I give you, "Polar Bears and Dogs playing". Very cool, thanks Hope!